Four lines. Ten stations. Zero hassle. the freedom to work wherever you want in the office. When the time came to replace their existing PBX legacy system, Oregon-based Craftwork Plumbing turned to VTech. The 4-Line Small Business System helped their administrative office streamline communication in a way cell phone communication couldn’t. The company also benefited from the system's practical features, competitive total cost of ownership, and easy installation. around phone lines or Ethernet drops. 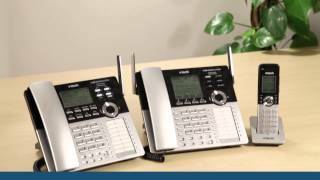 the #1 manufacturer of cordless phones in the world, with over 20 years of experience. Place the wireless microphones anywhere in a conference room and enjoy interference-free, high-quality sound. Program up to 32 phone numbers for easy one- and two-touch dialing (16 one-touch, 16 two-touch). Program the system to answer outside calls, provide callers with a company directory, automatically forward calls to specific extensions and let callers record voice messages when there’s no answer—any time of the day or night. Superior-quality voice and sound technology protects your calls from wiretapping, delivers the best range and prevents interference from wireless routers. 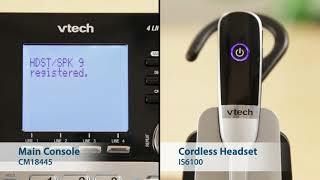 The cordless handset works as an independent station, with its own extension number and call log. Set up a separate mailbox, personal greeting and phone book; page and intercom other system devices; and forward calls and messages. Make and receive calls on all four lines even when the power's out. Music-on-hold functionality should only be used in conjunction with music specifically licensed for on-hold use. Licensed on-hold music is available from many third-party suppliers. 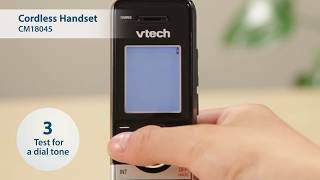 VTech disclaims any liability arising from the failure to obtain such a license. Recording time depends on individual message characteristics.